Middleton’s girls basketball team has traveled each of these paths this season and the Cardinals will do it again this weekend. Middleton received the No. 4 seed at the WIAA Division 1 state tournament at the Resch Center in Green Bay and will meet No. 1 seed Mukwonago in a semifinal game Friday at 6:35 p.m. The winner of that game meets either second-seeded Kimberly or third-seeded Bay Port in the state finals Saturday at approximately 8:15 p.m.
For Middleton, being discounted and snubbed has been par for the course this season. “I love being the underdog,” said senior point guard Charlotte Dunn. “We’ve kind of been that all season. JANESVILLE — With 5.7 seconds remaining, Middleton senior point guard Charlotte Dunn stepped to the free throw line and broke into a huge grin. Just finish off an impressive victory over a conference rival and let the party begin. But first, Dunn made eye contact with fellow senior and co-captain Hannah Flottmeyer, who began to tear up as they shared a moment they will treasure the rest of their lives. Dunn sank one of two free throws to put an exclamation point on an impressive 60-45 victory over Sun Prairie in a WIAA Division 1 sectional final held at Janesville Craig High School on Saturday afternoon. VERONA — The tension was palpable, the gym deafening. Nearly everybody inside Verona High School was on their feet. During the final five minutes of last Thursday’s WIAA Division1 girls basketball sectional final between Middleton and Madison Memorial, the Big Eight Conference rivals traded blow after blow. 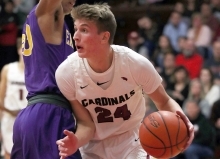 Thanks to smothering defense, though, and some clutch baskets down the stretch, the Cardinals rallied back from an eight-point deficit and downed the Spartans, 41-39. The win was the 12th in a row for Middleton and improved its record to 20-5. The win also placed the Cardinals in their second sectional final in three years. Memorial finished the year 19-6 and had its seven-game winning streak snapped. In many ways, they overachieved from Day 1. Middleton’s boys basketball team was dealt a crushing blow last October when Max Schlicht — arguably its most talented player — was lost for the season due to an ACL injury. In rather impressive fashion, though, the Cardinals still went 13-9 in the regular season, snapped an ugly losing streak against Madison Memorial and received the No. 6 seed in an 18-team sectional. Last Friday night, though, those accomplishments meant little. Visiting Janesville Craig toppled the Cardinals, 61-52, in a WIAA Division 1 regional semifinal. And as the Middleton’s coaches and players exchanged season-ending hugs and high-fives, there were tears coming from every corner of the Cardinals’ locker room. Middleton coach Kevin Bavery agreed. In some ways, the results were almost secondary. Middleton’s girls gymnastics team, a surprise participant at the WIAA Division 1 state meet held at Wisconsin Rapids Lincoln High School, was truthfully fine with whatever happened. “We were just happy to be at state,” Middleton coach Kari Steck. And that made the outcome easy to digest. Middleton finished 10th among 10 teams at the state team meet last Friday. Franklin captured the team title with a score of 148.2833, while Middleton was 10th at 130.7667. Then during the individual meet Saturday, Middleton senior Jordan Baggot was 22nd in the all-around competition, while sophomore Taylor Engelkes was 23rd. Middleton certainly wasn’t at its best at the team meet. Then again, no one was complaining.